Installing state-of-the-art solar panels on a quarter of a million roofs could meet one-sixth of Scotland's electricity demands, experts say. Scientists say the strategy could ease the plight of one in three Scottish households, which currently struggle to provide themselves with adequate heat and hot water. Researchers, business leaders and public sector experts have contributed to a report which sets out how Scotland could benefit from solar power. They say harnessing energy from the sun on the roofs of south-facing buildings could have significant economic, environmental and social impacts. The project - involving researchers at the University of Edinburgh - provides the most comprehensive assessment yet of Scotland's solar energy potential. Findings from the project reveal that solar power could help Scotland meet renewable energy targets, create jobs and ensure the energy needs of people in cities and rural areas are met. Experts are holding an event at the Scottish Parliament today (Monday 19 May) to raise awareness of solar technology and its benefits. Organisers will call for government, industry and academia to work together on solar energy strategies. Since 2001, the cost of generating electricity using solar panels has fallen by more than 70 per cent. Experts say that by 2025 it could become the cheapest way of harnessing renewable energy and provide electricity that is cheaper than fossil fuels. Developments in solar technologies are also making them more efficient and versatile. Scientists say many people are not yet aware that solar power can be generated effectively in Scotland. They point out that Germany - with a climate similar to Scotland - produces more energy using solar panels than any other country. 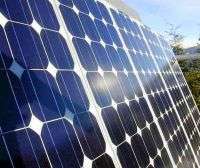 The study was supported by the Scottish Institute for Solar Energy Research, the Scottish Solar Energy Group, the Energy Technology Partnership, AES Solar and the Scottish Universities Insight Institute. Dr Neil Robertson, of the University of Edinburgh's School of Chemistry, said: "The plummeting cost means that large-scale solar power is coming to Scotland whether we realise it or not. The key priority is to recognise this, so that we can start planning to maximise the social, environmental and business benefits it will bring us." Scotland and Germany may share climate but not the more important latitude. Munch is 48 8, Edinburgh 55 55. Also notice the missing word in the following: "maximise the social, environmental and business benefits". No, "economics"--it can never pay for itself. High Scottish latitude means long winter nights and short winter sunless days. No storage technology exists that allows summer generated power to be used six months later when it is really needed. Fortunately, other people's taxes will pay for the solar panels as it does no doubt already for the staff at those behind the report (Scottish Institute for Solar Energy Research, the Scottish Solar Energy Group, the Energy Technology Partnership, AES Solar and the Scottish Universities Insight Institute). I hope Scotland can get economical Solar power, but it seems that they should be focussing on Wind, Wave, and Biomass. Scotland also has a good number of medium-sized sites for pumped-storage hydropower, to help match electricity demand with supply.